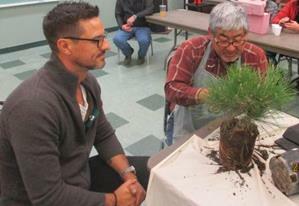 Santa Anita Bonsai Society | A community dedicated to the study and appreciation of the ancient art of Bonsai. 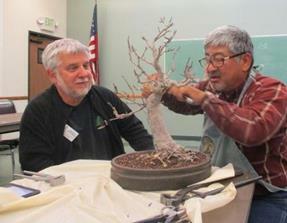 We have another great evening of bonsai planned for April. 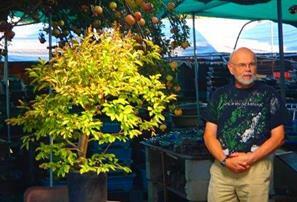 Our guest will be Ted Matson, so it will be an opportunity to learn the critical details of bonsai development. Ted has the wonderful ability to communicate his knowledge very clearly throughout his demonstrations. It is always a pleasure to watch and listen. 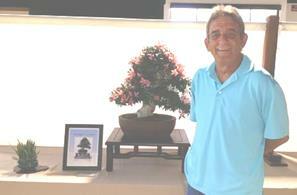 Ted began studying bonsai in San Francisco in 1979. He moved to the Los Angeles area in 1980, and over time, studied with Ben Suzuki, Shig and Roy Nagatoshi, Melba Tucker, Warren Hill, and John Naka. 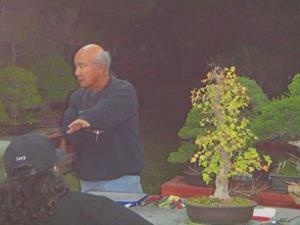 Ted started teaching bonsai classes at his home in the late 1980’s. In 2008 he began working at bonsai full time. 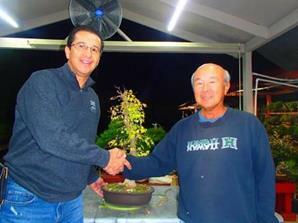 Ted is a member of Descanso Bonsai Society, California Shohin Society, California Bonsai Society, and Nampu Kai. 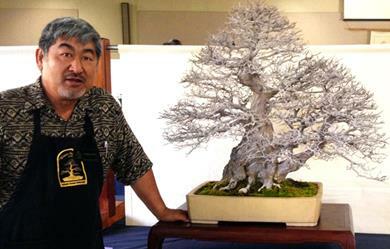 He oversees both the GSBF and Huntington bonsai collections, including more than 400 trees. There are approximately 70 trees on display at a time. 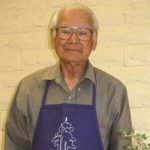 He has chaired both the GSBF Convention and the California Shohin Society Seminars and has done workshops and demonstrations across the U.S.
Ted’s demonstration material will be Mexican Guava. The demo tree will be in our raffle. He is bringing additional examples of the same material that can be purchased for a great price by anyone interested. Join us for a fun evening. Our Southern California weather is back and everything is growing and blooming. Now is when we need to watch our trees closely and not let them get “leggy”. It is important to nip or pinch terminal buds on each branch. This will force side branches to grow and create a more dense foliage mass while also shortening the internodes. As branches grow, watch the underside for downward growth and the topside for unwanted upward growth. Keep an eye on excessive growth in the upper portion of your trees that will draw energy away from lower branches. We are still in repotting season also. Repotting helps stimulate new growth, and our trees love new soil and a little extra space to grow. If you are changing pots, prepare the new pot with screens over the drain holes and tie-down wire to hold the tree in place prior to removing the tree from its current pot. If you are using the same pot again, keep the tree roots moist while cleaning and prepping the pot for reuse. I enjoy the sight of a newly repotted tree. You can almost see the refreshed tree generating new roots and shoots. We love seeing our trees thrive during the spring, but the fast growth requires our attention to maintain even growth from top to bottom. Enjoy the season, but be observant and diligent. We had plenty of member trees available for our workshop with Lindsay Shiba. He was able to spend quality time with each member while doing a wide variety of work. 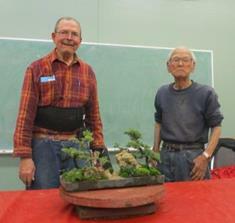 A couple of trees received their first styling as bonsai with the member’s participation. 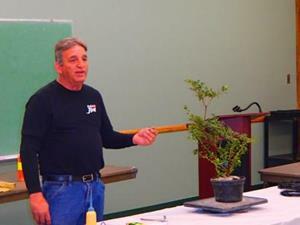 Lindsay provided pruning and styling advice for all the trees, and tree owners worked with him to improve their material. Lindsay talked about each tree, so all our members were able to learn from his vision. Multiple varieties of trees were involved, so advice and techniques differed from tree to tree. 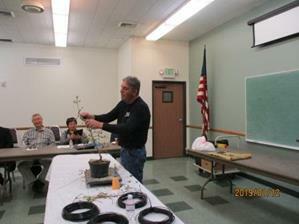 We got a very well-rounded presentation, and participating members went home with revitalized trees. Workshops are a good opportunity for developing the quality of our trees, and Lindsay’s help and advice was greatly appreciated. SABS membership is growing … Thank You! Membership in SABS is available anytime of the year . If you first join SABS during Oct-Dec then your membership is current until Dec of the following year. For renewing members the dues are requested each January. Our membership dues are vital to SABS remaining financially viable. It has been exciting to see how SABS’s membership has grown during the past year. Thanks for your participation and support. Bring a tree to the March meeting and take advantage of a free workshop with Lindsay Shiba. You are welcome to bring more than one tree. Lindsay will help you take your material to the next level of design and development. We don’t have workshops often, so don’t miss a great opportunity to learn. Bring your tools and wire and take part in the fun. 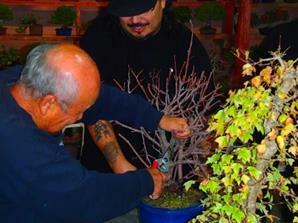 Lindsay started his bonsai training when he was just 11 years old. He learned from his father, Katsumi Shiba, and in 1972 he became a student of Khan Komai. 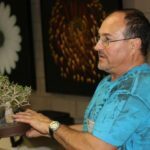 Under Khan’s tutelage, Lindsay refined his talent for bonsai and also developed a love and understanding of the formal display of bonsai. Lindsay has given presentations of formal display across the United States and Mexico. 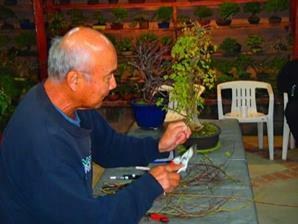 He worked at and later co-owned his family’s nursery business in Upland, where he also taught bonsai classes. 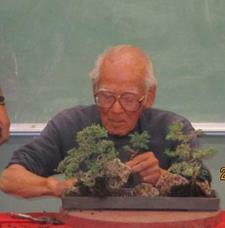 Lindsay is an active member of Baikoen Bonsai Kenkyu-Kai, California Bonsai Society and Nanpu Kai. You do not have to bring a tree to watch and learn from Lindsay at the meeting. However, why pass up the chance to have him help with your own tree. See you there. We have had a very different winter season this year, with the heavy rain and cold temperatures. Some of our trees have remained dormant longer, and some have been caught in-between, popping new foliage. We are at repotting time. It is important to keep track of when you have repotted individual trees to make it easier to pick out the trees that are due. I date an identification tag I make out of thin metal venetian blind material. I cut three inch pieces of metal and use a pencil to mark the potting date and stick the tag in each of my pots. The pencil marking goes on easy and doesn’t wash off with watering. I find the metal tags hold up better than plastic. I check my tags and make a repotting list based on dates along with visual inspection of tree health and drainage conditions (slow draining calls for repotting). Repotting is great for stimulating new root growth and generating vitality in our trees. I turn on some music and enjoy the time spent transitioning each tree. It is very relaxing and productive at the same time. So, get out the potting tools and material and refresh your trees. 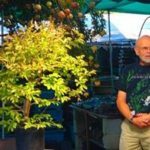 I hope you were all able to attend the Bonsai-A-Thon, a bonsai enthusiast paradise with the vendors, exhibits, demonstrations, raffles and auctions. 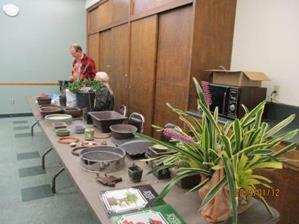 Once again, club member Kathy Boehme donated her hand-made bonsai pots, a total of 129, to the raffle. People were buzzing around the raffle tables admiring her pots and buying tickets to hopefully obtain one or more. All by themselves, Kathy’s pottery generates ticket sales that are a tremendous boost to the income that goes to support GSBF and The Huntington. 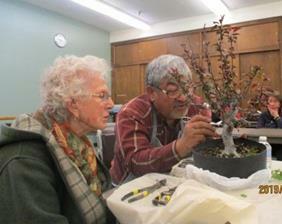 Kathy is a tremendous asset to the Bonsai-A-Thon and our club. Thank you, Kathy. It was a very busy and exciting month for bonsai. 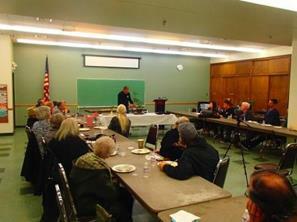 Members were treated to a wonderful saikei demonstration by Frank Goya at the February meeting. 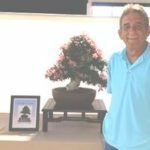 We had the pleasure of attending the famous, annual Baikoen Silhouettes Show, and just ended the month with the Bonsai-A-Thon. 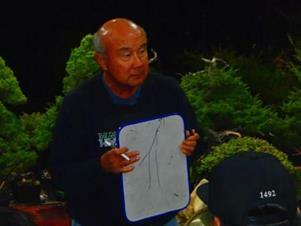 Frank Goya used three-year old procumbens nana junipers to construct his saikei. As usual, Frank had wired and styled the trees before coming to the meeting. He visualizes the rock and tree placement ahead of time, so his demonstration flows smoothly as he assembles the landscape. He used an odd number of rocks in his design and explained that the larger outside rocks are faced inward from both sides of the pot. He said the trees need to be placed so they flow in the same direction as the rocks. The flow of rocks and trees was toward the middle of the design where Frank placed his water effect (an integral part of most saikeis). 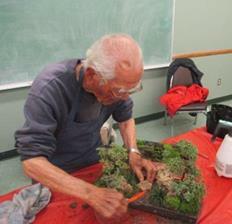 He filled in the planting with moss and small accent plants to complete the saikei design. Frank makes it look simple, but his work is very deliberate and precise. His artistry was a pleasure to watch, and everyone wanted to take the saikei home. Jim Pelling was the lucky raffle winner, and his wife Judith was thrilled to have a Frank Goya saikei. Our January 12 meeting will be a little different from our past holiday meetings. We will have our annual holiday potluck dinner and feature a guest speaker at the same time. Louis Camerota, a long-time club member, will do a presentation on azaleas. Lou’s beautiful azaleas have been awarded “best of show” in our club shows, so we know he is knowledgeable about their care. Lou was raised as a 3rd generation landscaper. 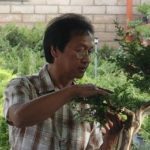 He started working with bonsai in 1990. 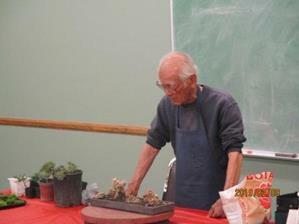 He originally learned about training Satsuki azaleas from Dwight Goins, a former student of Khan Komai. He also studied with Marty Hagberry. 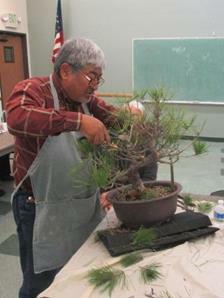 Currently, Lou is in his fourth year of study with David Nguy, and he specializes in Satsuki azaleas. Join us at 6pm as we start the new year, with a wonderful dinner, presentation, and fully-stocked raffle table. Welcome to a new year for enjoying the bonsai art. 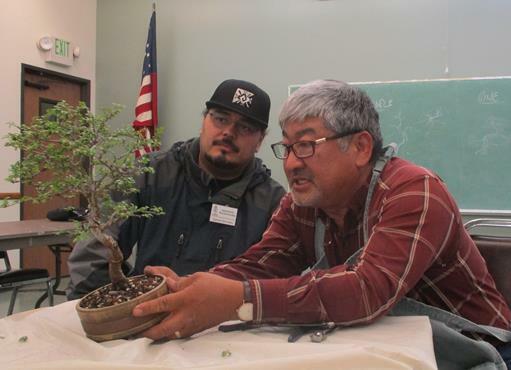 Our club was the recent recipient of a generous donation of bonsai items from the family of Edgar Fukutaki, a member of the club many years ago. Among others in the club, Edgar was a friend of Bruce and Yaeko Hisayasu. 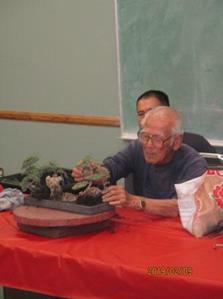 After Edgar and his wife passed, the family contacted me and offered to donate his bonsai pots, tables, and wire. I received over 50 pots, some display stands, and a large quantity of wire. Special thanks to the Fukutaki family for their thoughtfulness and generosity. Edgar’s bonsai items will be available on our raffle tables throughout the year, and I am sure our members will enjoy making use of them. We ended 2018 with a presentation by Dennis Makishima at the home of Peter and Marissa Macasieb. Dennis brought a trident maple that he used to demonstrate pruning techniques unique to tridents. The tree went to our raffle table at the end of the evening. Dennis explained that pruning branches or roots produces a callus at the cut, and new shoots will develop from the callus site. They can be removed or used to develop proportion in branch size working up the trunk. Dennis said branches that are aligned going up the trunk share the same water line from the roots for feeding the tree. If you cut a trident branch back to the trunk above other in-line branches, lower branches may die back all the way down. He suggested removing an unnecessary lower branch first and working up over time. Dennis also recommended keeping a tree in a larger container while branches are cut for styling so calluses heal faster. He said you can expand the root base of a trident by fusing a rooted cutting at the base of the trunk where you need new roots. By cutting the bark from the cutting and the matching position on the trunk you can tie the cutting to the trunk and have it fuse over time. The fused cutting will blend with the trunk, and new roots will be established for the tree. Thanks again to Peter and Marissa Macasieb for their hospitality. Dennis was very entertaining and informative. 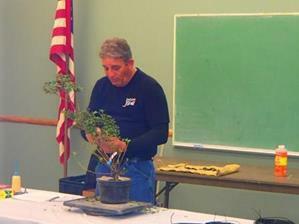 Everyone appreciated the extent of his knowledge and experience with trident maples. Palm Room 301 N. Baldwin Ave. 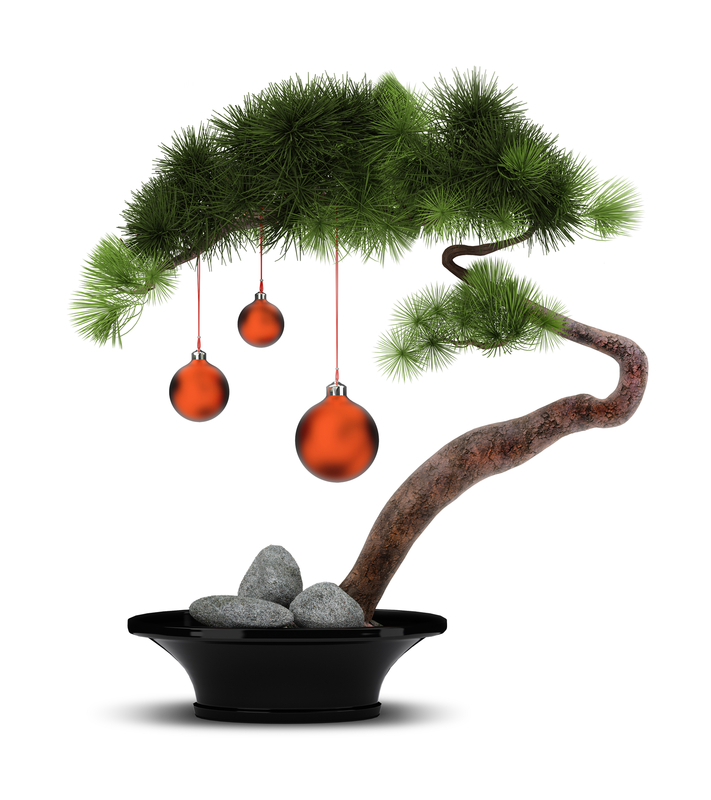 I want to just take a quick moment to say thank you to all of our members for all the work that is done throughout the year to keep Santa Anita Bonsai Society running. Thank you for you time, energy and love that is put into each meeting and event. 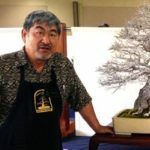 We are a volunteer organization dedicated to the expression and learning of the Art of Bonsai, but every little bit of help that is given is what makes this group special. From the immense amount of work it takes to coordinate our yearly show, to the scheduling of new fun and informative guest speakers, the over seeing of our monthly raffle, to the supplying of drinks and snacks, and everything in between; most importantly to all of your attendance to our meetings and events. Thank you. I wish you all a very Merry Christmas and joyous holiday season. May you, your families, friends and of course, your trees have a prosperous and happy new year. We look forward to seeing you all for another great year of exciting meetings, learning and appreciation of this wonderful and very special art.